Was at the Try-n-Save the other day, doing my worst impression of a well-organized Passover shopper. TIP ALERT! this year write down everything you make during Passover on one sheet, and create a shopping list on another. Come next year just pull out those lists before you head to the supermarket. You'll save as much as 100 bucks and have less pesadik leftovers to anonymously leave on your neighbor's porch. Yo! 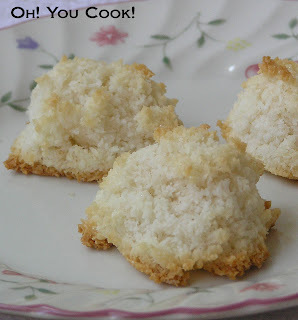 Coconut's not on the list because MIL always provides most of the seder desserts and you don't plan to make anything else with coconut anyway. It's that time again, Dear Reader, for another Secret Recipe Club reveal. My assignment this month -- which I chose to accept -- is Chocolate & Chillies. Asiya posts recipes that are all halal, which is similar enough to kosher that I don't have to worry about pork cooties or other major revisions. And does she have recipes! They all look amazing! With so many from which to choose, I had a long road ahead trying to zero in on just one. For about 5 seconds, anyway. You see, in a week I will be hosting a meeting of reference librarians, and as host I have to provide the refreshments. So I was glad that Asiya's brownie recipe beckoned, even with "low fat"in the title. With Passover looming ever closer, I have to use up chometz anyway, so this was a win-win situation. In this case, it turned out to be a win-win-WIN! 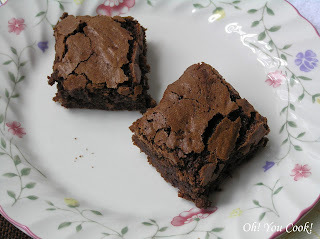 These beauties are so delicious they just became my favorite brownies!